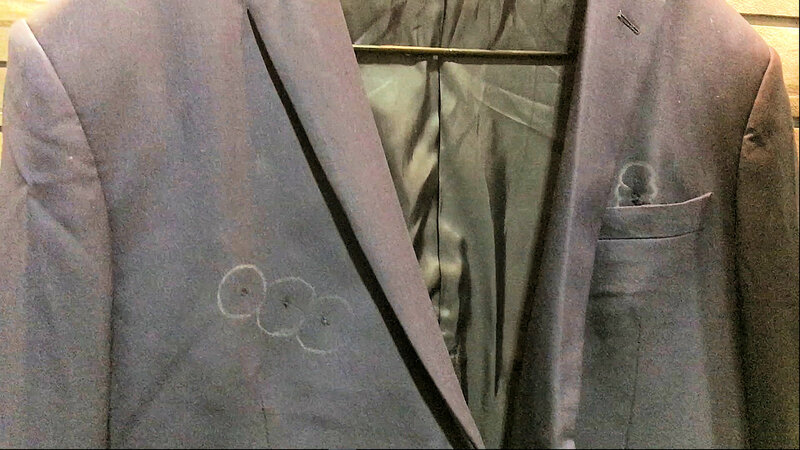 James Bond 007 Tech: Aspetto NIJ Level IIIA Soft Armor Bullet-Resistant Blazer/Sport Coat for Ultra-Lo-Pro/Lo-Vis Ballistic/Body Armor Protection! (Video!) | DefenseReview.com (DR): An online tactical technology and military defense technology magazine with particular focus on the latest and greatest tactical firearms news (tactical gun news), tactical gear news and tactical shooting news. 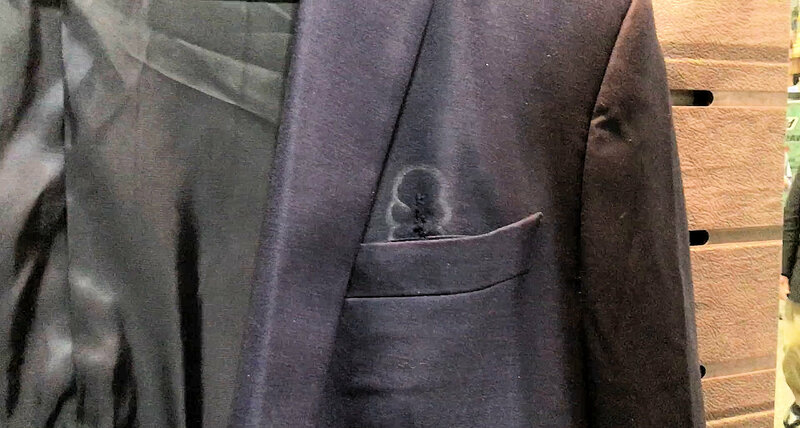 As long as we’re covering interesting Aspetto products, we should perhaps also mention the ultra lo-pro/lo-vis (low-profile/low-visibility) bullet-resistant blazer/sport coat they make, which immediately made us think of James Bond. 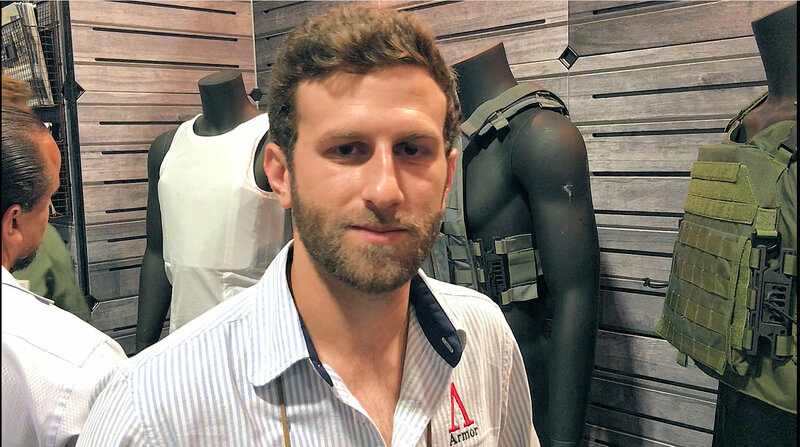 Aspetto CEO Rob Davis told DefenseReview (DR) that the Aspetto bullet-resistant blazer can be made with either NIJ Level II or Level IIIA (most popular) ballistic protection against 9mm Parabellum/9x19mm NATO-level ballistic threats. 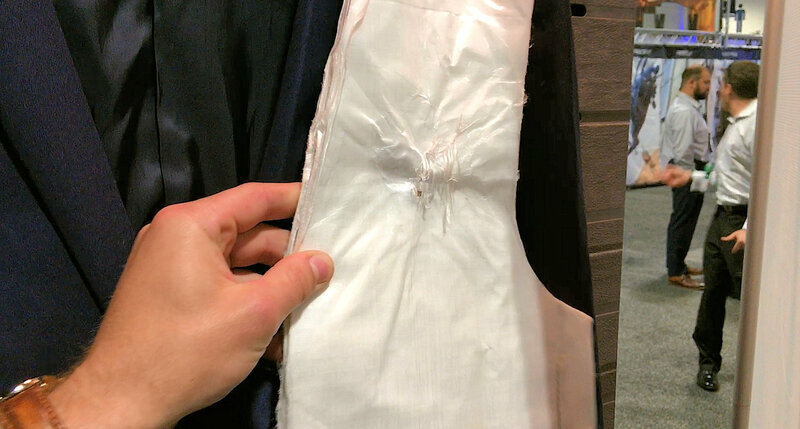 In DR’s video below, Mr. Davis explains how the internal soft armor is supported inside the jacket. 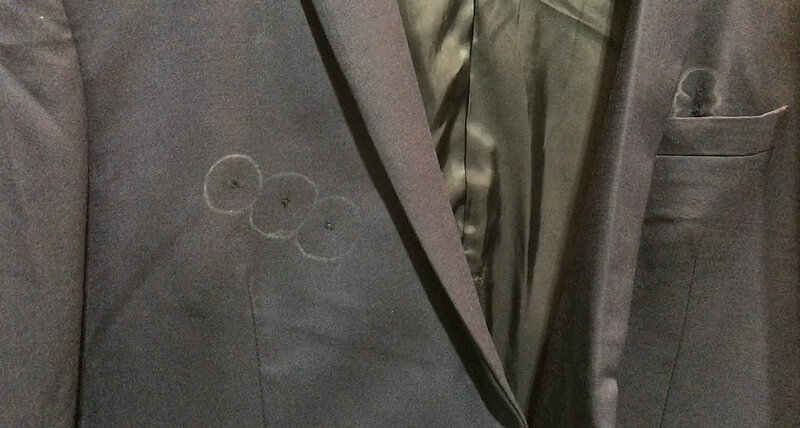 An Aspetto bullet-resistant blazer certainly isn’t inexpensive, but it’s worth every penny when your life’s on the line and taking fire from a pistol-armed assailant. Great investment under those circumstances. 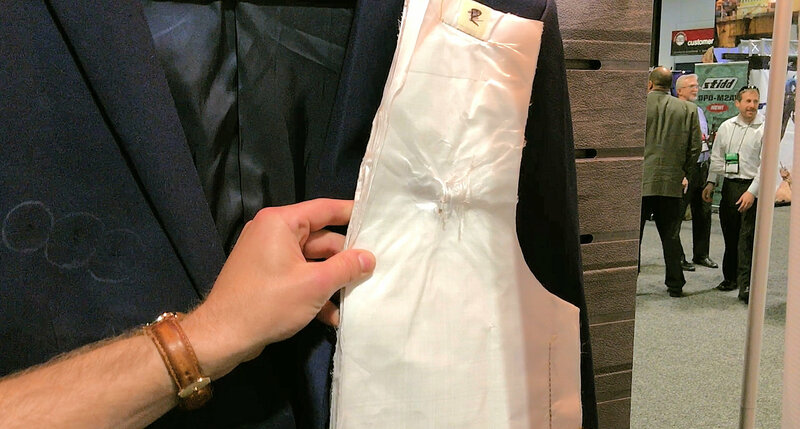 Aspetto will of course tailor the jacket to your exact physical measurements. 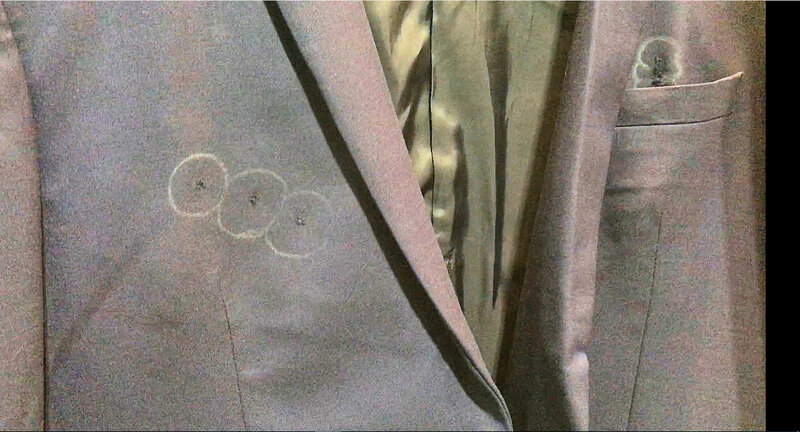 It’s Defense Review’s understanding at present that this ia a fully-bespoke jacket. 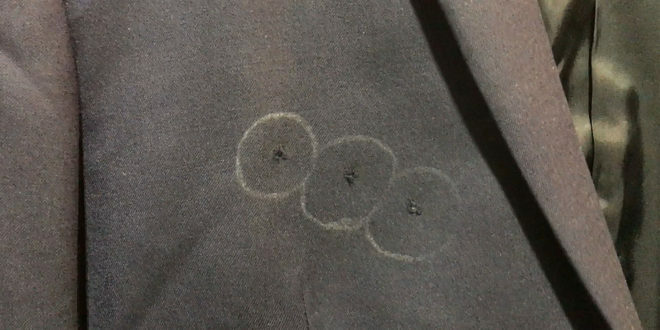 Editor’s Note: The a number of the accompanying photos have been brightened to highlight the bullet holes in the jacket’s fabric (outside the ballistic armor), but this is a dark Navy Blue jacket. Angel Armor Truth SNAP Concealable Magnetic Hard Armor Plates and RISE Plate Carrier System! Will TALOS (Tactical Assault Light Operator Suit)-Outfitted Future Soldiers Get Lightweight Abalone Shell-Based Flexible Scalar Biomimetic Metal Foam, Carbyne (Linear Acetylenic Carbon) and/or Multilayer Graphene Ballistic Armor Composites? Tactical Assault Light Operator Suit (TALOS) + FlyBoard Air Ducted-Fan Hoverboard = Flying Super Soldiers: Future Military Special Operations Forces (SOF) Assaulters/Operators to Fly Themselves to the Target in Exo-Armor ‘Iron Man’-Type Combat Suits? USSOCOM Tactical Assault Light Operator Suit (TALOS) Exo-Armor Combat Suit for the Future Soldier/Warfighter: ‘Iron Man’, or Future Iron Thud on the U.S. Military Procurement Scrap Heap? DR Exclusive Interview! : HyperStealth Quantum Stealth (QS) Light-Bending Passive Adaptive Camouflage (Camo)/Visual Cloaking Technology for the 21st Century Future Soldier/Warfighter: Beyond SMARTCAMO Color-Changing Hybrid Camouflage, Beyond Fictional Alien Predator’s Active Electro-Optical Camouflage/Invisibility Cloaking Tech! Next: Williams Blade Design ‘Special Mission Project’ HZT 002 Hira Zukuri Tanto 6.5″ Fixed-Blade Combat Tanto Knife for Dynamic Close Quarters Battle/Close Quarters Combat (CQB/CQC) Edged Weapons Combatives and Military Special Ops!